This writ petition which has been instituted by Lok Prahri, a society registered under the Societies Registration Act, 1860, seeks to challenge the constitutional validity of the amendments made by Parliament to the Salary, Allowances and Pension of Members of Parliament Act, 19541. The petitioner has challenged the validity of the provisions by which Parliament has legislated to provide for pension and for the grant of facilities to former members of Parliament. "106. Salaries and allowances of members:-Members of either House of Parliament shall be entitled to receive such salaries and allowances as may from time to time be determined by Parliament by law and, until provision in that respect is so made, allowances at such rates and upon such conditions as were immediately before the commencement of this Constitution applicable in the case of members of the Constituent Assembly of the Dominion of India." (ii) Unlimited train travel in I AC from the Member's usual place of residence to Delhi and back even when Parliament is not in session. (b) in Section 8A for monthly pension of Rs 20,000/-. (vi) Articles 125 (2), 221 (2) and 148 (3) provide specifically for the grant of pension to Judges of the Supreme Court and High Courts and to the Comptroller and Auditor General of India. The doctrine expressio unius est exclusio alterius will mean that something which has not been contemplated by Article 106, cannot be legislated upon in an enactment which is referable to that Article. G. A Joint Committee in Parliament had, in its report of May 2006, suggested the setting up of a permanent mechanism for the determination of salaries and allowances of Members of Parliament. At an all party meeting convened by the Speaker on 23 May 2005, there was unanimity on the need to institutionalize a mechanism for fixing the salaries and allowances of Members of Parliament. (ii) the legislative amendment for removing the minimum qualifying requirement of four years was effected after the decision of the Supreme Court. These submissions now fall for consideration. Provided that where a person has served as a member of the Provisional Parliament or either House of Parliament for a period exceeding five years, there shall be paid to him an additional pension of one thousand five hundred rupees per mensem for every year served in excess of five years. Explanation. - For the purpose of this sub-section, "Provisional Parliament" shall include the body which functioned as the Constituent Assembly of the Dominion of India immediately before the commencement of the Constitution." "8AC (1) On the death of a member of either House of Parliament during his term of office, his spouse, if any, or dependent of such member shall be paid during the remaining period of life of such spouse or, as the case may be, such dependent so long as such dependent continues to be a dependent within the meaning of clause (aa) of Section 2, family pension equivalent to one-half of the pension which such member of Parliament would have received had he retired. Provided that no such family pension shall be payable to a dependent if such dependent is a sitting member of Parliament or is drawing pension under Section 8A. Parliament or the Provisional Parliament at any time before the commencement of the Salary, Allowances and Pension of Members of Parliament (Amendment) Act, 2006 and died after serving as such member. Provided that such spouse or dependent is not drawing any pension under this Act or is not entitled to draw family pension under the proviso to sub-section (1). Provided further that no person shall be entitled to claim arrears of any family pension under this sub-section in respect of a period before the commencement of the Salary, Allowances and Pension of Members of Parliament (Amendment) Act, 2006." (ii) free travel by any railway in India in first class air-conditioned or executive class in any train with the spouse, if any, of the member from any place in India to any other place in India and if such journey or part thereof is performed by air, from any place other than usual place of residence of the member, to Delhi and back, to an amount equal to the fare by air for such journey or part thereof or the amount equal to the journey performed by air from the usual place of the residence of the member to Delhi and back, whichever is less. Provided that where a Member has no spouse, such Member may be accompanied by any person in place of the spouse, and notwithstanding anything contained in clause (i), the person so accompanying shall be entitled to every facility available to the spouse. (b) when Parliament is in session, by air or partly by air and partly by rail, from the usual place of residence of the Member to Delhi or back, subject to the condition that the total number of such air journeys shall not exceed eight in a year:"
without payment of any charges on the basis of an authorisation issued for this purpose by the Secretariat of either House of Parliament as the case may be." The basic postulate of the submission of the petitioner is founded on Article 106 of the Constitution. The foundation of his submission is that when the law was enacted in 1954, Parliament intended to legislate with reference to its power under Article 106 of the Constitution. Under Article 106, the entitlement of Members of either House of Parliament is to receive salaries and allowances as may be determined by Parliament by law. The submission is that since the legislative ambit of the power of Parliament is confined to Members, it cannot comprehend a former member of Parliament, and salaries and allowances would not include a pensionary benefit. "Article 195 makes similar provision in respect of the Members of Legislative Assemblies and Legislative Councils of the States. 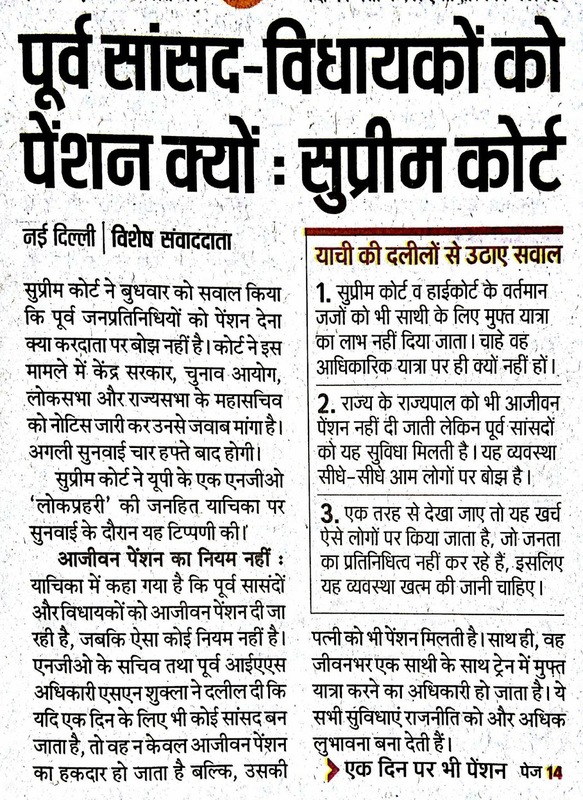 It is pointed out by Mr. Prashant Bhushan that whereas legislators are thereby entitled to salaries and allowances, there is no provision in regard to the payment of pension to them. The provisions of these Articles are contrasted by learned counsel to the provisions of Articles 125 and 221. Article 125(2) says that Judges of the Supreme Court shall be entitled to such privileges and allowances and to such rights in respect of leave of absence and pension as may from time to time be determined. There is a similar provision in regard to High Court Judges in Article 221. Our attention is also drawn to Article 148 which makes reference to the pension of a Comptroller and Auditor General. Learned counsel's argument is that where pension is to be paid to a constitutional functionary, the Constitution makes specific provision and that, therefore, in not making such specific provision in regard to Members of Parliament under Article 106, it must be assumed that they are not entitled to receive pension." "The issue before us is squarely one of competence, namely, the competence of Parliament to enact the said Section 8-A. We need not go into Entry 73 of List I, for, we are in no doubt that such competence is conferred upon Parliament by the residuary Entry 97 of List I and there is no provision in Article 106 or elsewhere that bars the payment of pension to Members of Parliament." The judgment of the Supreme Court is a clear answer to the submission of the petitioner that the enactment of a law for the purpose of the grant of pension to persons who were members of Parliament is prohibited by Article 106. Once the Constitution Bench has ruled that Parliament did, in fact, have the power to do so, the legislative competence of Parliament being referable to Entry 97 of the Union List to the Seventh Schedule, any argument to the contrary cannot be entertained. The submission, however, of the petitioner is two fold. Firstly, it has been submitted that the provision which was sought to be challenged before the Supreme Court was Section 8A in its original form which contained a qualifying period of four years before a member would be entitled to the grant of pension. The qualifying requirement, it has been submitted, was removed by a subsequent legislative amendment and, hence, the decision of the Supreme Court would not save the subsequent legislative amendment from challenge. The second argument is that the judgment in Common Cause does not address the constitutional challenge on the ground of a violation of Article 14 of the Constitution. We will deal with the submission of arbitrariness in a subsequent part of the decision. However, the submission based on legislative competence would not become open to challenge before this Court merely because subsequent to the decision of the Supreme Court, a legislative amendment operated to lift the qualifying period of four years for a member to draw a pension. The issue of whether or not such a qualifying requirement should be in place, does not raise any matter of legislative competence. If Parliament does have the legislative competence to enact a law on the subject of pensionary benefits to its former members, it is competent to define the conditions on which or subject to which such a payment should be made. The submission of the petitioner, hence, does not reach out to a matter of legislative competence. Once the Supreme Court upheld the legislative competence of Parliament to enact the law in the judgment of the Constitution Bench in Common Cause, that part of the submission would stand foreclosed in these proceedings. Undoubtedly, the law as it was originally enacted, envisaged the payment of salaries and allowances to Members of Parliament. The provision for payment of pension was brought in by a legislative amendment in 1976. 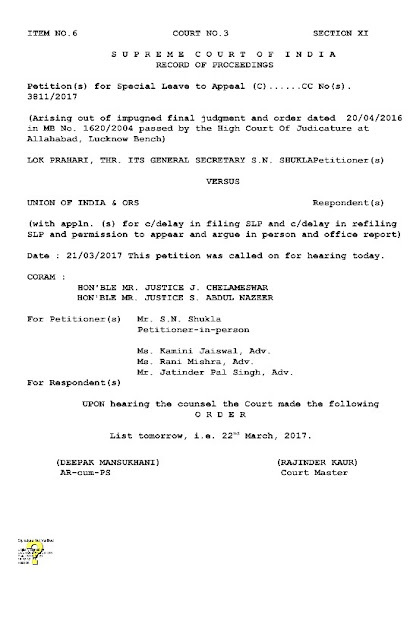 The petitioner places a considerable degree of reliance on the views expressed in the Constituent Assembly on the basis of which it has been submitted that the framers of the Constitution did not envisage that legislators would be entitled to the benefit of pension. The spirit of the Constitution is pressed in aid to urge that the grant of pensionary payments to Members of Parliament would be ultra vires. Another limb of the same submission is that membership of Parliament does not constitute an employment nor is there, strictly speaking, a retirement of the nature referable to a contract of an employer with an employee when he/she attains the age of superannuation. Hence, it has been submitted that there is no justification for the grant of pensionary payments. The issue of justification has to be considered strictly in the context of a challenge under Article 14 of the Constitution. If Parliament does have the legislative power to legislate with respect to pension to its members - as indeed it does - the constitutional validity of the enactment cannot be struck down on the basis of what the petitioner perceives to be the spirit underlying the provisions of Article 106 as they were adopted in the Constituent Assembly. Article 106 is not the sole repository of the power of Parliament to enact legislation with reference to salaries and allowances or pensionary benefits payable to its members. Once Article 106 is not construed to be exhaustive of the legislative power of Parliament or to impose a prohibition on the legislature legislating to provide something which may not strictly fall within the purview of Article 106, the argument of the petitioner must necessarily fail. In any event, the constitutional validity of a legislation cannot be assailed on an ephemeral assumption of what constitutes the spirit of the Constitution. A law can be invalidated in the exercise of the power of judicial review if it is contrary to the express provisions of the Constitution or is lacking in legislative competence. It would not be open to the Court to strike down legislation which is enacted by a body which has legislative competence and despite the law not being contrary to constitutional provisions, on the supposed ground of the spirit of the document. Nor, for that matter, are we impressed with the submission that the concept of pension cannot apply to a Member of Parliament. A pensionary payment in the conventional sense is a payment made to an individual in consideration of past service rendered, usually in the context of a contract of employment. The issue, however, is not about a label or appellation but whether, in substance, Parliament has competence to grant the benefit of a payment, by whatever name called, to its former members in recognition of the role discharged by them as its members. Whether it is to be termed as pension for the purposes of legislation or by any other phrase, would be to beg the question. The essential issue is whether such a payment can be legislated upon in the first place. If, as we have held, Parliament possesses the legislative competence to do so, the grant of the benefit cannot be assailed on the ground that a pensionary payment is not apposite to the work which is rendered by representatives chosen to the House of People or the Council of States. Members of Parliament are elected representatives of the people, chosen to represent their constituencies in the august hall of debate and discourse that represents the essence of Indian democracy. Members of Parliament are elected by the people as representatives : persons who represent the voice and aspirations of the people whom they represent. The grant of pensionary payments is intended to subserve the need to protect a dignified condition of life to a member after he or she ceases to be a Member of Parliament. The need for a former member of Parliament to live a life of dignity after ceasing to be a member is not merely a matter of concern for Members of Parliament themselves but an issue which is vital to the functioning of democracy. There is a vital societal interest in ensuring that persons who have held an important constitutional position as elected representatives in Parliament should be able to live with dignity by the provision of a pensionary payment. This is a valid assumption which the legislature which enacts the law can make and one which must pass constitutional muster when challenged before the Court. The conditions subject to which the grant of pension should be envisaged is a matter which lies, in our view, in the discretion of the body which enacts the law. In every case involving the grant of pension, it is necessary for the law which confers the right, to define eligibility and conditions subject to which the benefit can be availed of. These are matters which lie in the province of the legislature. Unless the conditions are shown to be palpably unconstitutional, judicial review would not extend to second guessing the legislature. The Court, it is trite law, would not substitute its opinion of justness for the view which has been formed by Parliament while enacting the legislation. Originally, the law, as enacted, stipulated a minimum qualifying period of four years for the grant of pensionary benefits. Parliament in doing away with that stipulation cannot be held to have transgressed any constitutional boundaries or limits. Whether the stipulation should be of four years or some other period or whether there should be a stipulation of a time period for a member to be entitled for the grant of pension are matters of legislative policy. For these reasons, we are of the view that there is no substance in the submission that the grant of pension violates Article 14 of the Constitution. "4. Learned counsel drew our attention to the judgment of this Court in D.S. Nakara & Ors. 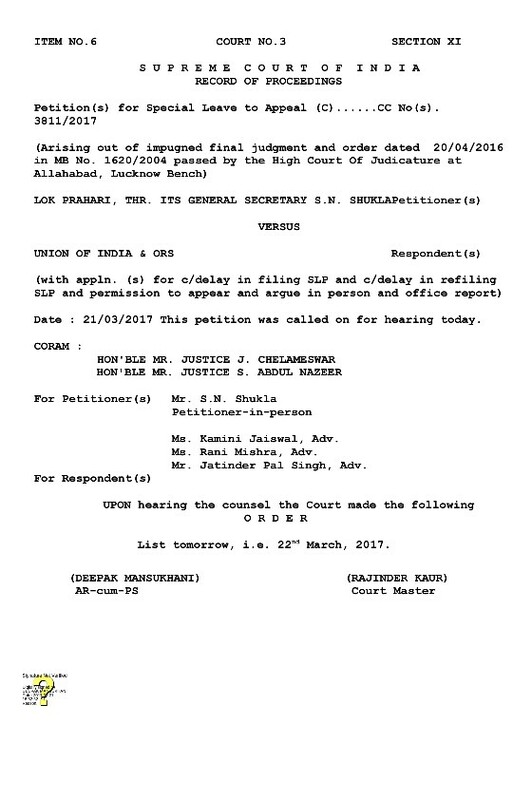 v. Union of India [1983(1) SCC 305] where it has been said that pension is a term applied to periodic money payments to a person who retires at a certain age, considered the age of disability, and it usually continues for the rest of the natural life of the recipient. In the case of Members of Parliament, it is submitted by learned counsel, they do not retire and they are not always of an age of disability when they demit office. 5. 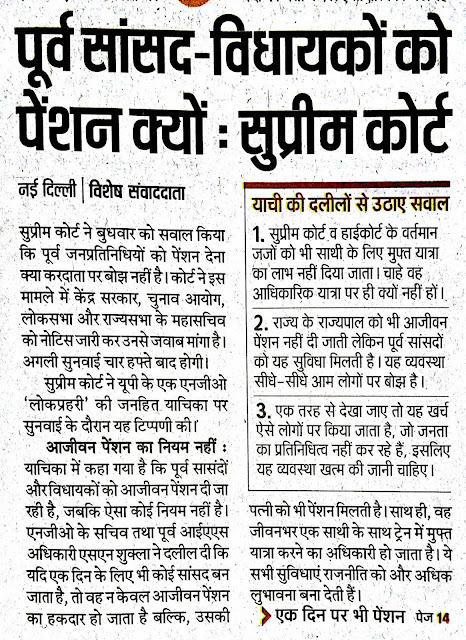 Reference was made by the petitioner in W.P. (C) No. 246/1993, appearing in person, to the provisions of Article 14 and it was submitted that there was discrimination in favour of Members of Parliament by giving them pension when, unlike Judges, they were not subject to the process of impeachment." The writ petitions before the Supreme Court were dismissed as being devoid of merits. Once that was the position, the argument on the ground of a violation of Article 14 must, insofar as this Court is concerned, be treated as being concluded by the judgment in Common Cause. Nonetheless, for the sake of completeness, we have dealt with the submissions of the petitioner and have found no substance. The petitioner has sought to challenge the provisions by which Members of Parliament have been granted travel facilities which extend to the spouse of a Member and to former members. Section 6B (1) (ii) allows a Member of Parliament free travel by any railways in India "in first class air-conditioned or executive class" with the spouse, if any, of the member from any place in India to any other place. Sub-section (2) which contains a non-obstante clause allows a spouse of a Member to travel any number of times, by railways from the usual place of residence of the Member to Delhi and back. In these proceedings which involve a challenge on the ground of a violation of Article 14 of the Constitution, the Court has to be careful enough not to delve into the legislative wisdom of such a measure. On the contrary, Parliament in enacting the law has taken a robust view of the matter by taking notice of the fact that a Member of Parliament must be required to travel together with her or his spouse. Members of Parliament lead stressful lives. Parliament was entitled in its legislative judgment to form the view that the effective discharge of duties as a Parliamentarian would envisage the provision of facilities necessary for the efficient discharge of those duties. Article 14 does not prohibit such a legislative assessment or the formation of a legislative judgment of that nature. We may also note that clause (a) of sub-section (2) of Section 6B provides for travel from the usual place of residence of the Member to Delhi, a journey which Parliament has realistically assumed, would be required to be undertaken for the effective discharge of duties. The provision for a family pension has been brought in by way of an amendment introduced by the insertion of Section 8AC. Sub-section (1) of Section 8AC stipulates that on the death of a member during the term of office, the spouse, if any, of such a member or a dependent shall be paid, during the remaining period of life and so long as a dependent continues to be a dependent, one-half of the pension to which a Member of Parliament would have been entitled, had he retired. Under sub-section (2), family pension is also payable to the spouse or a dependent of a person who was a member of either House, even prior to the commencement of the Amending Act of 2006. The introduction of a provision for the grant of a family pension is in the nature of a social welfare measure intended to provide a sense of security to a spouse or dependent of a member of Parliament who has died. The expression 'dependent' has been defined by Section 2 (aa). In our view, the grant of family pension to the spouse or dependent of a former member of Parliament is a matter of legislative policy. There is no constitutional prohibition on Parliament adopting such a measure of social security for its former members. The nature and extent of payment are not such as would implicate the vice of arbitrariness under Article 14. For these reasons, we have come to the conclusion that the petition is lacking in merit. The petition shall accordingly stand dismissed. However, there shall be no order as to costs.